Plot Outline: It is the year 2005. 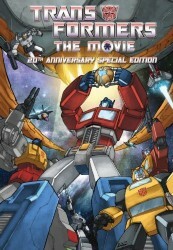 And the battle between the heroic Autobots led by Optimus Prime and the evil Decepticons led by Megatron and StarScream. Two warring factions of transforming robots from the planet Cybertron. The Autobots must save their home planet from an evil entity known as Unicron, who's ready to consume anything that stands in its way. At the same time, they must defend themselves from an all-out attack from the Decepticons. Along the way, lives are lost, battles are fought, and a new Autobot leader is born as another dies.